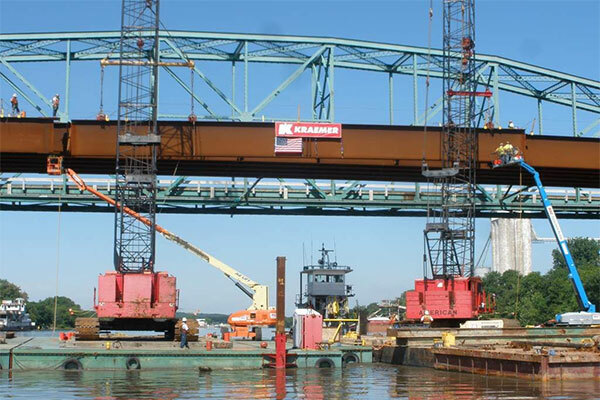 Kraemer replaced the existing IL 170 Seneca Bridge over the Illinois River with a new bridge on a new alignment. Work included new roadway approaches and the demolition of a 1930s 4-span through truss bridge. The new 1,703-foot-long, 10-span structure includes two 12-foot travel lanes with 3-foot shoulders. The bridge carries a 5-foot sidewalk separated from the southbound traffic lane by a concrete barrier. Piers on land are founded on 5,108 linear feet of H-pile where two each river piers were constructed with a cofferdam and five each 5-foot diameter drilled shafts per pier. Work for the project also included constructing both concrete and HMA pavement, earth embankment and grading, storm sewer and drainage structures, and bridge deck and roadway lighting.